Spring rolls are an important recipe in the Chinese menu and is a favorite among many of us.Usually the spring rolls are deep fried,but this time I tried the baked version for the challenge" Fried to Fav" hosted by Nupur @ UK Rasoi and they turned out real crisp,puffed and delicious,only thing I lacked was the deep brown color outside.The color was not evenly browned at all sides. (as seen in images but otherwise they were as crisp as the fried ones,the outer cover literally broke down in bits when you bite through.So,if u wish to be healthy then this one would be the best.And if you wish to go by the color too just a small tip- After bake,you can just shallow fry them in a tsp of oil in a non stick pan to evenly brown all sides.I tried this too for one batch,but unfortunately by the time I could click snaps,I was left with none..:-(sorry about that but that can be done easily !! -Then,let it cool for sometime.Pour the cooked veggies in a colander or in a muslin cloth,squeeze & drain the excess water.Place it on a cutting board, and chop all the veggies again to smaller bits. -Add the cut veggies in a bowl and add all the sauces,salt and pepper powder. -Preheat oven to 375 degrees F and keep a tray lined with parchment paper. 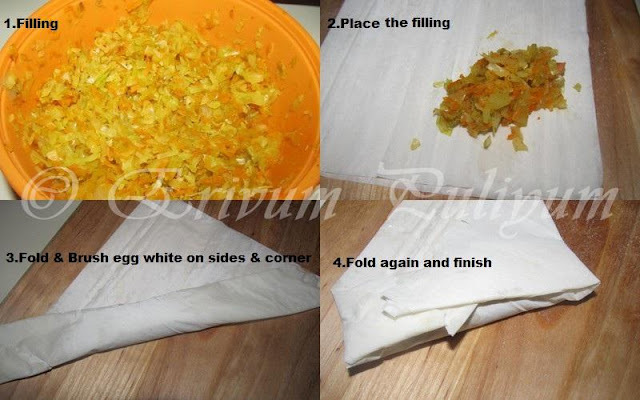 -Then,fold the sides towards the center and keep rolling till you finish the ends.Keep the closed side down on the tray.Apply /Brush egg white on the top too. -Place it in the oven and bake for 15 minutes.After 15 minutes,turn the rolls and bake again for 10 minutes until slightly browned. -Remove from oven and serve hot with ketchup !! * You can add ajinomotto for added flavor but I don't favour ajinomotto much,so haven't added it. * All the sauces contain salt so add the regular salt accordingly to the filling. * You can modify the sauces and spices as per your likes. * You can also add more veggies like spring onion,bell pepper too. Baked vegetable spring roll looks delicious. Healthy version of spring rolls. Perfect snack!! Looks as yummy as fried version..
julie spring roll turned out excellent dear.... without deep frying..
so crispy, look delicious, especially since these are baked! nice spring rolls...crunchy and crispy. Simply love baked snacks as we can indulge without much guilt. Looks good !! yum! spring rolls are one of my fav! :). They look fantastic. mm.. yummy .. I bought the phyllo sheet 2 weeks back.. will try it definetely..
All crisp and nice and perfect with sauce on side. Yummy. Oh ,You made that too Julie..Truly a worth effort.I would love to try this way.Guilt free. neat presentation.. it has come out well..
Who can resist the spring roll. And this looks great! 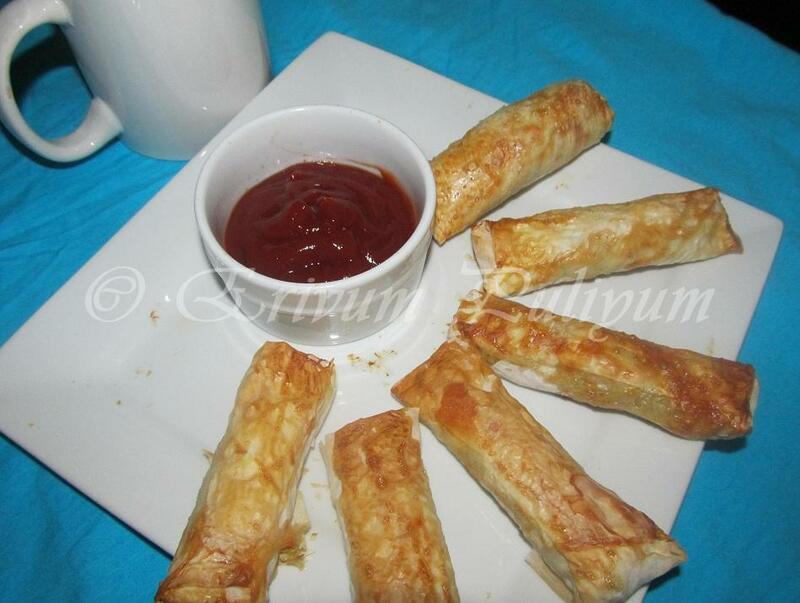 Wow..Julie, baked spring roll looks crunchy and yummy. Looks delicious! A nice twist to spring rolls! The baked ones also look so crispy..will try doing that next time.. 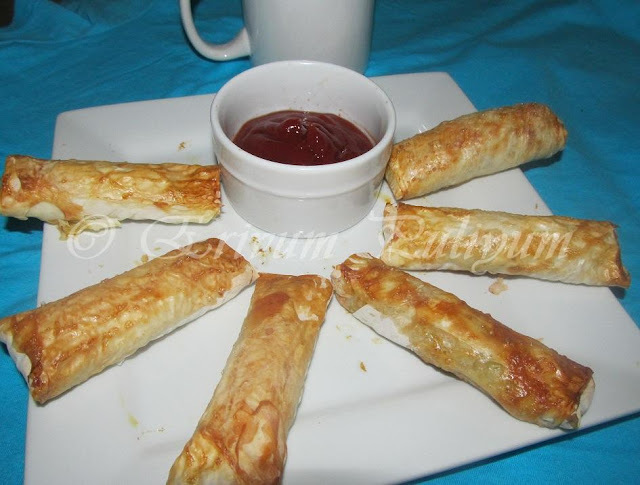 Thank you for linking it to the event "From Fried to Favourite"
Guilt free rolls looks irresistible. I always bake my spring rolls!They are so yummy! Guilt free and yet very yummy..
Looks super easy and healthy. I will try this for sure because I love spring rolls. Perfecto!! Never thought spring rolls could be baked! They look just perfect dear. Pappadam | Kerala Pappad | How to fry Pappadam ? ?